Hidden Village, a new community of 200 rental residences by Roger Mumford Homes and Heartstone Development, LLC, is coming to Aberdeen. “Nestled on 28 acres of beautifully wooded land, Hidden Village boasts innovative apartments, most with direct-access garages, in a convenient, commuter-friendly location,” said Roger Mumford, managing member of HVA Development, LLC. 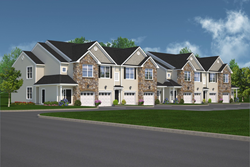 Hidden Village, an exceptional new community of 200 exclusive rental residences, is coming soon to Aberdeen, NJ. The rental homes and clubhouse are expected to open late summer with occupancy beginning in September. Those interested can sign up to be a Hidden Village VIP at HiddenVillageAberdeen.com. “Nestled on 28 acres of beautifully wooded land, Hidden Village boasts innovative apartments, most with direct-access garages, in a convenient, commuter-friendly location,” said Roger Mumford, managing member of HVA Development, LLC. "Hidden Village exists within picturesque, tree-covered surroundings, offering 360-degree views of natural green landscapes that creates a peaceful and private neighborhood. Residents will also enjoy access to a fabulous community clubhouse and pool with no amenity charge. Additional parking spaces are also available at no extra expense." Residents may choose from distinctive home designs that range from one bedroom and one bath to two bedrooms and two-and-a-half baths with a study. These inviting floorplans offer up to 1,643 sq. ft. of rental space with spacious kitchens, open living areas and bedroom retreats, as well as private, direct-access garages and storage space in most homes. “Elegant, authentic stone exteriors combined with upscale interior appointments such as sleek, alabaster cabinetry, quartz countertops, designer tile backsplashes and bath tile,” Mumford added. Hidden Village also features standard two-car parking, Energy Star® certified green building measures that minimize utility costs and support a sustainable environment, advanced sound mitigation construction to enhance privacy, full-time, onsite responsive management team; a pet-friendly neighborhood, in-home washer/dryer and stainless steel appliances, and private first-floor entry. abound with Holmdel Park, Cheesequake Park, and the Sandy Hook National Recreation Area in close proximity. For fine dining restaurants, trendy boutiques, and a buzzing nightlife, Red Bank is also a short distance away. Getting around is effortless with easy access to major roadways like Route 35, the Garden State Parkway, and I-195.